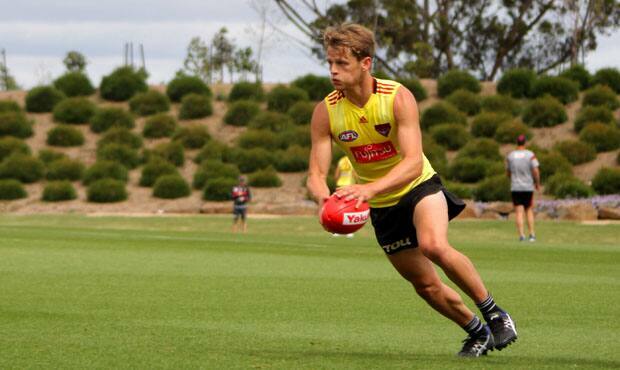 Will Hams has earned his second chance on the Essendon list. Will Hams has worked hard for his second chance at AFL footy. The young midfielder has had an unlucky run during his short career, struck down with injury at several stages inhibiting his ability to string together any consistency. After missing all of the 2014 season with a hip injury, Hams dedicated himself to his rehabilitation and fought hard to get fit for this year. His efforts were rewarded when he was able to complete a full pre-season and return for the Bombers’ final NAB Challenge game against Melbourne earlier this year. Hams would start the year off playing for Essendon VFL before earning selection for the ANZAC Day clash. Starting as the substitute, Hams demonstrated the hard attacking traits he is well known for around the Club. The 21-year-old’s season would once again be cut short, as the youngster suffered another series of injuries which saw him sidelined for the rest of the year. However, once again fit and demonstrating great signs in the pre-season, the Club is confident Hams will be able to find the consistent game time in 2016. “He’s 100% sound,” List and Recruiting Manager Adrian Dodoro said. Hams’ dedication to keep going despite all the setbacks he has faced is a quality that is highly valued by both his teammates and coaches, and part of the reason the Bombers committed to redrafting him as a rookie for the 2016 season. “Hams is one of our favourites at the Club,” Dodoro said. “He’s a great young man. He puts his head over the footy and you couldn’t meet a more determined person. Drafted in 2012, Hams has played five games since making his debut in 2013. Hopefully, Hams can remain injury free in 2016 and demonstrate to the wider football community just why he is so highly rated internally.